Imagine that terrible feeling you get when you get a low battery warning on your device, and there is no power outlet around. You feel disappointed and even worse miserable. But with a good portable solar charger, you can charge your devices wherever you are using the power of the sun. So, whenever you are going hiking, camping or any other places, you can get your devices juiced up. 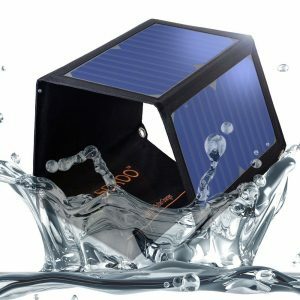 The Sokoo 22W portable solar charger is a water-resistant charger with a PVC fabric canvas that can protect against high humidity, thunderstorms and ocean splashes. 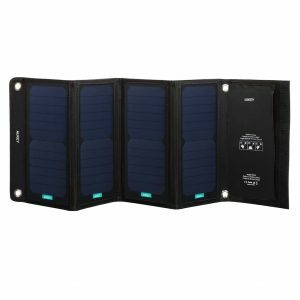 The portable solar charger had two USB ports with smart IC technology. It comes with an attachment hook that you can use to connect it to a backpack for charging on the go. It can supply a charge of 2.4A or 3.3A. It weighs about 17.5 Oz. The Sokoo 22W comes with smart IC technology to determine the best charging voltage for any device that is connected to it. 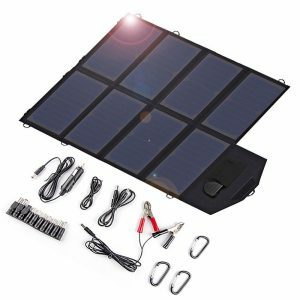 The X-Dragon 40W SunPower solar panel charger provides 2.8A of power that can charge tablets, smartphones and laptops. It is portable thanks to its slim and portable design, and it comes with a carabiner that can be hooked to backpacks. It has a 10-in-1 connector that makes it capable of charging almost any device. It has SolarIQ technology to help it determine the right voltage and technology for any device. It comes with a 5V/2V charging port for smartphones and tablets and another 18V DC port for laptops. It has a large 40W solar panel. 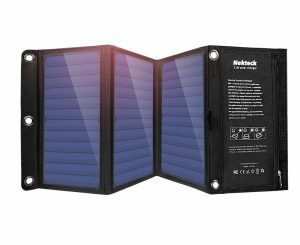 The Nektech 21W solar charger is a portable charger with a compact design. It comes with 2 USB ports for charging 2 devices simultaneously. It also comes with smart IC chip that can identify devices that are plugged in and determine the right charging speed for them (2A or 3A). It has a rugged canvas build that makes it perfect for outdoor usage. It weighs 18 ounces and measures 6.3 x 11.1 x 1.96 inches when compact. When open, it measures 26.3 x 11.1 inches. 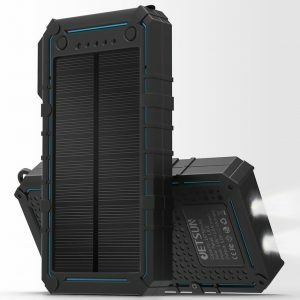 The Jetsun solar portable power charger is the best portable solar charger for campers. It comes with a 16,750mAh battery and a solar panel. It comes with 2 USB ports that can charge two devices simultaneously. It also comes with an LED light that can be used as a nightlight in the outdoors. The LED light displays the percentage of charge left in the portable solar charger. The solar charger can charge your smartphone full within two hours. It takes about 8 to 10 hours to charge fully. It is portable and can be hung on a backpack, so it can charge while you are moving. It is dustproof, waterproof and shockproof. The shell of the Jetsun solar portable charger is also made of water-resistant plastic. The Aukey 28W is a rugged solar charger that can be used anywhere. It comes with a weather-resistant and water-resistant PVC fabric. The solar panels are scratch resistant and are made of laminated PET. It is a lightweight product that weighs just 2.1 pounds. It is about 1.8 inches thick when it is folder. The Aukey 28W has two USB ports that supply 2.4A each. The solar panels are high-efficiency panels that provide up to 23.5%. The Aukey 28W comes with carabiners for attaching it to a backpack and charging it on the go.